Microfiltration, ultrafiltration, nanofiltration and reversed osmosis are pressure driven processes. 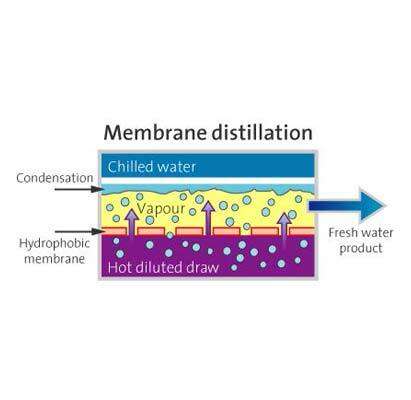 By applying pressure the water flows through the membrane and components with a certain size are retained. The figure shows the size of components passing each type of membrane. The pressure driven membrane processes are also used in Forward Osmosis applications, where they are used for Draw Solution Recovery. The picture shows a pilot of BLUE-tec, in which RO and MD can be applied after FO. Membrane bioreactors are used in wastewater treatment. In a membrane bioreactor the final settler is replace by a membrane systems, resulting in a compact and highly efficient biological treatment system. Membrane bioreactors are used in industrial and municipal wastewater streams and manure treatment.